To compromise willingly is tough. But if the Aquarius man and the Aries woman learn to do this, they will be a happy couple. The key to a strong foundation in the life of this wonderful couple is to make way for each other and not let the ego’s play havoc. Though it is easier said than done, unlike most other couples, the Aquarius man and the Aries woman will be able to accomplish this feat and make the most of their companionship. With strong qualities of the Aquarius man, the Aries woman will find herself in a soup for she will not know how to react to him and his ways. The Aquarius man is independent and strong, he is always willing to go the extra mile for his loved ones and will make sure that his life will mean something when he is gone. He is headstrong and determined, unlike the Aries woman, who is easy going. Such differences may create tiffs in the couple, but nothing of the magnitude that they will not be able to endure. The Aries woman, though naive is a good fit for the Aquarius man. She is quite malleable, unlike her partner and with that quality she can manage to eradicate many troubles from their lives. She is also very witty and is an intellectual which is a good combination for the Aquarius man for he likes to be around woman who are more than just "beautiful on the outside". Their compatibility will show on emotional as well as physical levels and if you spot two people in serious conversation in a party, you can be sure that it will be the Aquarius-Aries couple. Though they are very strong individually, their personalities melt into one when they are together. The Aries woman is quite powerful in her own right when she is on her own and same is the case with her Aquarius man. However, their wit and intellect will overlap and give the world a chance to look at how wonderful a couple can be together. 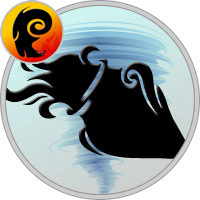 The Aquarius man and his Aries woman may spot trouble quite often in their relationship. One might argue that so is the case with almost all the couples on the planet. However, though they will have fights and troubles looming over their relationship, the couple will manage to stand out of it. They will make a conscious effort to be together and when they succeed, they will see how good they are together.